The Advantage of Van Dorm Realty | Van Dorm Realty inc. Simply because we care! 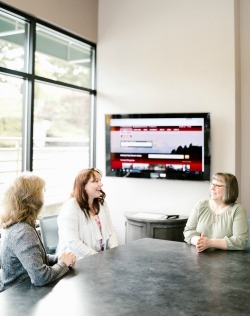 It's not by accident that we have been the leader in Thurston County Real Estate for over 30 years. It has been our commitment to putting our heart and soul into our sales professionals by providing the best support systems possible, the best advertising possible, and one on one personalized training. Our commitment is to provide you with all the tools you need to succeed as well as the training to make you the most knowledgeable real estate professional in the business and not "nickel and dime" you along the way as other real estate companies do. A responsive website that has been optimized for all devices. An easy to use, drag-and-drop, mobile friendly website editing tool that allows you to create and modify your website from any device. A powerful CRM mobile application that notifies you of new leads and how to properly respond to them while you’re on the go. Our CRM will allow you to manage your leads and import them as well. It is tightly synced with your website, so any leads generated from your website will be instantaneously synced with your CRM. Whether you access it your phone or computer, you will have the tools necessary to respond to your clients. We never want you to feel bogged down in the details. Only free to serve your clients and build your business. Management team - besides growing up in the business, Jeff & Diane Pust have over 50 years of paid combined real estate experience including mortgage lending, appraisal, and real estate sales. Support Staff - Our team will handle all the details of advertising your properties, inputting your listing and sale information into the MLS, and quality control to make sure you do things perfectly! The least tenured member of our support team has 16 years of experience! Telecommunications - We have all the latest phone technology for those on the go with personalized fax numbers, off site phone transfers, email and text notifications and more. No need to come into the office as your business will follow you wherever you go. Our signs - the most recognized sign in Thurston County in front of more sellers homes than any other. Drive around and verify for yourself. Northwest Real Estate Guide - We place all of our active residential listings in this monthly publication with thousands distributed throughout Thurston, Lewis, Mason & Grays Harbor counties. Realtor.com - The Number One real estate website in the world! All of our listings are showcased here. Craigslist and many other web postings done for you. VanDorm.com - Built with direct input from our clients and brokers. Dozens of other websites - Google, Yahoo, Trulia . . . We put our listings anywhere and everywhere prospective buyers and sellers may be looking. Personalized Web Site - We provide all of our brokers with a personalized web site. Showcase your own listings and inquiries go to you. Office networking - Over 90 brokers sharing opportunities. Hear about the latest listings before they hit the market giving your buyers the inside track; Spread the news about your listings personally giving your sellers direct access to over 10% of Thurston County's real estate sales force; Add your new listings to our weekly office tour allowing Van Dorm brokers to preview your properties and provide you and your sellers with valuable market feedback. We believe in training. Our training program will help you get your real estate business up and running as fast as possible as well as provide you with the confidence you need to provide the best service possible to your clients. Weekly small group training sessions - Perfect your skills here! Sample topics include: Building a business plan, time management, how to work by referral, listing presentation skills, working with buyers, how to sell new construction, pricing properties, and many more. Lots of role play too. One on one training - We want you to be the best so we spend our time personally with you. We share not only the basics of real estate with you but time tested real life scenarios to help you become one of the best in the business! Don't worry about a monthly office bill with us. Our brokers save thousands as we provide all the sales tools one needs at almost no cost. No desk fees, no open house fees, sign fees, technology fees, etc.